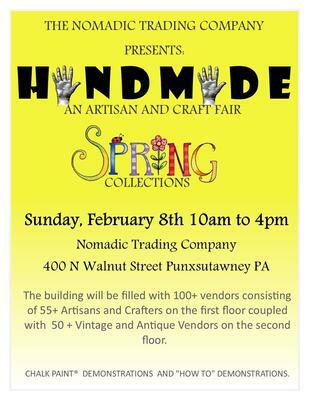 The Nomadic Trading Company at 400 N Walnut Street Punxsutawney PA is hosting an all "HANDMADE" Artisan and Craft Fair. The building will be filled with 100+ vendors consisting of over 55+ Artisans/Crafters on the first floor coupled with 50+ Vintage and Antique Vendors on the second floor. Our "Handmade" Fair Vendors are coming from 15 different counties, 30 cities, as far as Pittsburgh and Erie, to bring you a unique shopping experience. Thank you so much for letting us know about this really unique "Handmade" Artisan and Craft Fair coming in February, 2015.